Former Liberal Democrat peer Lord Lester, who has been accused of sexual harassment, will not be immediately suspended from the House of Lords. The Lords committee that oversees members' behaviour had written a report recommending that Lord Lester of Herne Hill be immediately suspended. But the issue was debated on Thursday, and peers voted to send the case back to the committee to look at it again. Lord Lester denies all allegations. 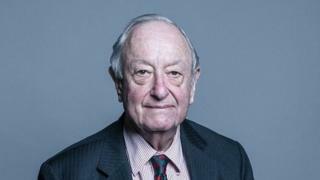 A report by the Privileges and Conduct Committee earlier this week upheld a complaint received in November 2017 of sexual harassment against Lord Lester, 82. It said Lord Lester "breached the provisions of the Code in failing to act on his personal honour by sexually harassing the complainant and offering her corrupt inducements to sleep with him". Lord Lester described the claims as "completely untrue". The report recommended suspending Lord Lester until 2022, which would be the longest suspension in modern parliamentary history. But on Thursday afternoon, the independent peer and QC, Lord Pannick, proposed that the case be remitted to the committee in the interest of "natural justice and fairness". After a lengthy debate, peers voted by 101 to 78 to support Lord Pannick's amendment. Lord Lester is currently suspended by the Liberal Democrats.